Seven important breaks occur in the Kansas record: (1) the present surface; (2) pre-Tertiary post-Cretaceous; (3) pre-Cretaceous post-Jurassic; (4) pre-Triassic post-Permian; (5) pre-Pennsylvanian post-Mississippian; (6) pre-Mississippian (considering Chattanooga as Mississippian) post-Devonian; and (7) pre-Paleozoic post-Precambrian. Such designations as "pre-Tertiary post-Cretaceous," as applied to the surfaces discussed in this section, are obviously imprecise. Geologic time is conceived to be continuous, and a land surface produced or modified by erosion cannot originate instantaneously. It follows that placement of the surface in geologic time is only approximate, that is, partly pre-Tertiary, or late Cretaceous, and partly post-Cretaceous, or early Tertiary. The same observations apply to each of the other surfaces. 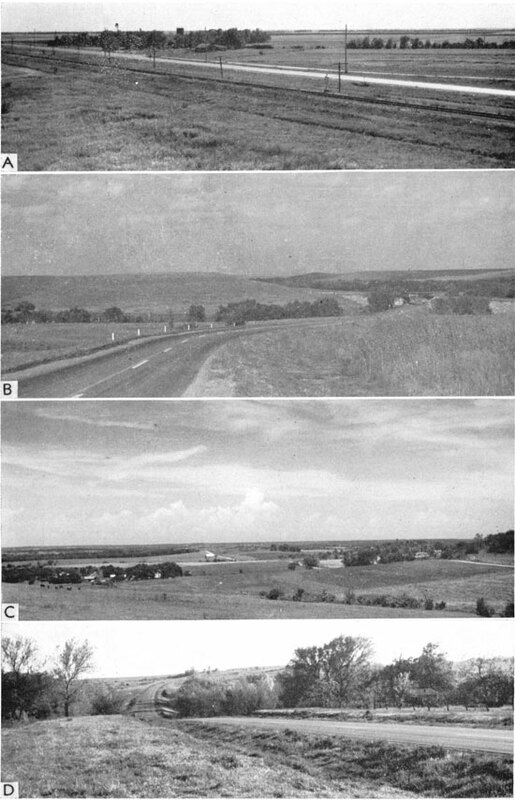 The present land surface in Kansas is an important key to understanding the geologic history of the area (Jewett and Merriam, 1959). This surface slopes gently eastward through the eastern part of the High Plains (Pl. 23A), Plains Border, Smoky Hills (Pl. 23B), and scarped Osage Plains (Pl. 24D) in the east. The altitude of the highest point, Mount Sunflower in Wallace County, is 4,039 feet above sea level, and the lowest point, in Montgomery County, where Verdigris River enters Oklahoma, is about 700 feet. Areal geology of the present land surface is shown in Figure 90. Eastward inclination of the land surface is discordant with the regional structure of all outcropping rocks older than Tertiary. It is believed that the present eastward slope of the land was established late in Tertiary time. Plate 23--A, View of High Plains about 7 miles west of Hoxie, Sheridan County. 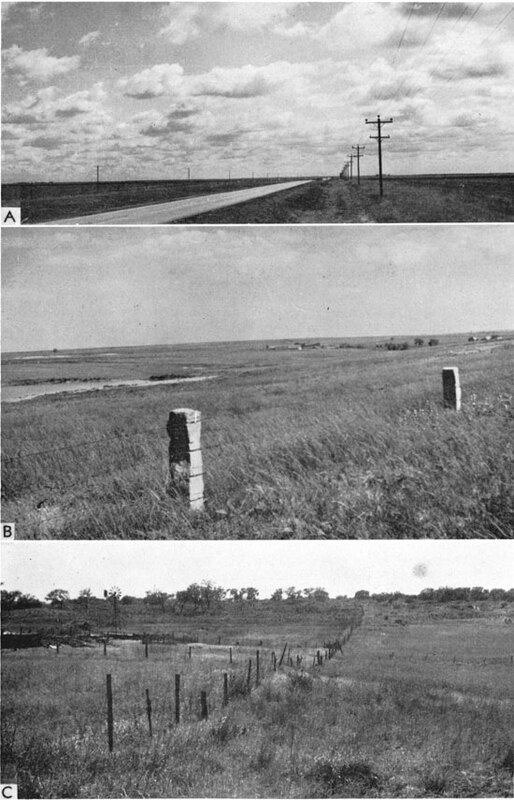 B, Fencepost Limestone fenceposts and rolling hills in Dissected High Plains of central Kansas. C, Sand dune topography in Great Bend Lowlands just northeast of Hutchinson on Kansas Highway 61, Reno County. Plate 24--A, "Equus beds" in McPherson Lowland at southwest edge of McPherson, McPherson County. B, View of Flint Hills, Chase County. C, Kaw Valley in northwestern Douglas County; view from Mile 43 on the Kansas Turnpike. D, Osage Cuesta country along U.S. Highway 59, about 5 miles south of Garnett, Anderson County. Figure 90--Generalized geologic map of Kansas (adapted from Moore and Landes, 1937). Older bedrock formations are exposed progressively eastward. Seven small igneous bodies crop out in Riley and Woodson counties. An Acrobat PDF version of this figure is available. In Kansas, from the Flint Hills eastward, outcropping Pennsylvanian and Permian rocks dip gently to the west and northwest. Average inclination of beds is only 20 to 25 feet per mile. The Nemaha Anticline interrupts and locally reverses the dip of outcropping strata, and the westward regional dip is also modified in many other places. For several miles west of the Flint Hills the situation is comparable, except that the direction of dip of Permian rocks is more westward (Pl. 24B). The dip of beds away from the Ozark area in Missouri probably is the result of regional uplift centered in the Ozark area. Because of the monotonous westerly dip of beds, the name Prairie Plains Monocline (Prosser and Beede, 1904) has been applied to the structure of eastern Kansas, although it is more properly called the Prairie Plains Homocline. Most of the tilting developed after deposition of Permian sediments. In eastern Kansas, remnants of three or more alluvial terraces that lie from a few feet to about 200 feet above the valley floors are common (Jewett and Merriam, 1959). Their histories are probably connected with glaciation. Alluvial terraces border the streams in southeastern Kansas, as well as those in and near glaciated northeastern Kansas. Glacial till and outwash materials are present almost everywhere in the part of northeastern Kansas bounded roughly by Kansas River and Big Blue River; bedrock outcrops are scarce in the glaciated area (Pl. 24C). Thick deposits of loess border the Missouri and Kansas River valleys. The eastern margin of Cretaceous deposits in Kansas has retreated farther west in southern Kansas than in the central and northern parts. Hence, along or near the southern boundary of Kansas, Permian rocks outcrop within 100 miles of the Colorado line (Fig. 90). These Permian beds are younger than those exposed farther east. The Blaine Formation, mentioned previously as a subsurface marker, crops out in Comanche and Barber Counties, and hills in Barber County carved in Nippewalla redbeds are capped with this gypsum formation. In the same area widespread slump topography has developed where the Blaine anhydrite and gypsum beds have been dissolved away. The Smoky Hills, eroded from Dakota sandstone and clay, mark the approximate eastern edge of Cretaceous deposits. Comanchean beds are present in areas just east of the Dakota hills; in Clark, Comanche, and Kiowa Counties, Comanchean beds crop out in a sizable area. These deposits, Kiowa Shale and Cheyenne Sandstone, are exceptionally well exposed in the vicinity of Belvidere in Kiowa County. The Blue Hills are eroded Cretaceous deposits marking the eastern margin of the High Plains in north-central Kansas (Fig. 91). Figure 91--Physiographic map of Kansas (from Schoewe, 1949). The High Plains are developed on Pliocene beds and veneered with Pleistocene. This thick accumulation of mostly unconsolidated material makes up a great wedge of silt, sand, clay, and gravel in western Kansas. The outcrop pattern of the contact between Cretaceous (or very locally in southern Kansas, Permian beds) and overlying thick and extensive Tertiary deposits is very irregular because of recent erosion. In Wallace County the line of contact is within a few miles of the Colorado border. The High Plains are divided by the Arkansas River Lowland where large areas of unconsolidated Quaternary silt, sand, and gravel occur and hummocky sand dune tracts are widespread (Pl. 23C; McLaughlin, 1949). Just to the northeast are the "Equus beds," or so-called McPherson Lowland (Pl. 24A). The pattern of sub-Cenozoic geology harmonizes with the regional surface geology of Kansas, as shown on the Geologic Map of Kansas (Moore and Landes, 1937), although the Permian has not been subdivided (Fig. 92). The Cheyenne, Kiowa, and Dakota are grouped together, as are the Greenhorn and Graneros, in keeping with the units shown on the geologic map. The Carlile, Niobrara, and Pierre are shown separately, and a small area of Dockum? (Triassic) is shown in the extreme southwestern corner of the state. Figure 92--Map of Kansas showing areal geology of surface below Cenozoic deposits (in part from Merriam and Frye, 1954). An Acrobat PDF version of this figure is available. Boundaries of the various units are indicated in the position they now occupy, whether or not they are covered by Cenozoic deposits; therefore, the map is partly a subcrop map. Most of the Cretaceous formations have outliers east of the main outcrop belt, indicating, of course, that they formerly extended farther east than they do now. Because Upper Cretaceous units lithologically show no evidence of shoreline or near-shore features, it may be inferred that the Cretaceous extended farther east, but how far is a question; some of the units probably have extended to flanks of the Ozarks. Likewise, all units of the Pennsylvanian and Permian Systems must have extended farther eastward than they do now. Again, how far the resistant scarps of the Permian and Pennsylvanian deposits have retreated westward in Cenozoic time is questionable--probably not far. Enormous quantities of rock material were removed from Kansas during Cenozoic time. Even if all the Cretaceous units thinned eastward and many were never deposited east of the Kansas-Missouri boundary, the volume of this material now gone staggers the imagination. Much of it must now constitute part of Tertiary deposits of the Gulf Coast. The inferred surface here considered, entirely or partly pre-Cretaceous and entirely or partly post-Jurassic in origin, is shown in Figure 93. It is essentially a subcrop map except for eastern Kansas, where Cretaceous deposits are absent. The Permian-Pennsylvanian contact was moved eastward and straightened to indicate that it undoubtedly has migrated downdip since Jurassic time. Figure 93--Map of Kansas at Pre-Cretaceous Post-Jurassic time showing rocks underlying Cretaceous deposits in western part and inferred position of Pennsylvanian-Permian boundary in eastern part. An Acrobat PDF version of this figure is available. The Triassic is represented to extend beneath Jurassic deposits in southwestern Kansas. The present southeastern extent shown for the formations probably is erosional, and the strata formerly extended farther to the southeast. Figure 94--Map of Kansas showing position of rock units immediately underlying Mesozoic beds or where Mesozoic cover is absent their inferred position in pre-Mesozoic time (in part from Merriam, 1957b). Outcrop pattern of Permian formations in western Kansas is controlled by configuration of Hugoton Embayment of Anadarko Basin. An Acrobat PDF version of this figure is available. Possible locations of different units in the Pennsylvanian and Permian are shown. In eastern Kansas, the outcrop lines trend approximately north-south and beds dip gently westward. The pattern reflects the structure of the Ozarks to the east and the downwarped Hugoton Embayment in southwestern Kansas, so that the lines in Kansas swing around the northern end of the embayment and strike northwestward, then northward, and finally northeastward. Levorsen (1960) figured the dip on the westward-dipping homocline in central Kansas to be about 7 feet per mile at the time of covering by Mesozoic deposits. The pre-Pennsylvanian post-Mississippian surface in Kansas is probably the most important buried unconformity in the column, for structural features pictured by the subcrop pattern define the main structural and petroliferous provinces in Kansas. Some of these structural elements inherit attributes from earlier tectonic activity, but for the most part they seemingly originated in crustal disturbances that occurred between mid-Mississippian (probably post-Meramecian) and mid-Pennsylvanian (probably post-Morrowan pre-Desmoinesian) time. It is possible to recognize and thus to locate inferred subcrops of the Mississippian, Devonian, Silurian, Maquoketa, Viola, Simpson, Arbuckle, and Precambrian on the pre-Pennsylvanian surface (Fig. 95). Mississippian rocks are the most widespread of the deposits beneath the Pennsylvanian, occurring everywhere except on upwarped areas of the Cambridge Arch, Central Kansas Uplift, Pratt Anticline, and Nemaha Anticline. Many areas of Precambrian underlie the Pennsylvanian in cores of uplifts. Some of these areas are bounded by faults. Younger units, chiefly Arbuckle, border the Precambrian; distribution of formations within the Arbuckle would indicate much of interest, but at present it is not possible to differentiate them on a usable scale. Figure 95--Map of Kansas showing rocks underlying Pennsylvanian beds (in part from Lee, 1956; Merriam, 1955b; Lee and others, 1946; Berry and Harper, 1948; Hiestand, 1935). Mississippian rocks are present except on Nemaha Anticline, Central Kansas Uplift, Cambridge Arch, and Pratt Anticline, where rocks as old as Precambrian underlie Pennsylvanian. An Acrobat PDF version of this figure is available. Present distribution of Mississippian units under the Pennsylvanian indicates that they once covered the entire state and since have been eroded from the uplifts (Fig. 96). The youngest Mississippian rocks occur in the deepest portions of the basins, and successively older Mississippian beds are encountered proceeding outward from the basinal centers, until on the higher parts of the upwarped areas the Mississippian is completely missing. If all Mississippian units formerly extended across the uplifts, the amount of sediment derived by their removal is voluminous. This material undoubtedly went into forming lower Pennsylvanian strata in surrounding areas. Figure 96--Map of Kansas showing generalized distribution of Mississippian units below Pennsylvanian deposits (from Lee, 1956; Veroda, 1959, Beebe, 1957; Maher and Collins, 1949, Sloss, Dapples, and Krumbein, 1960). Area of controversial Cowley Formation is shown in south-central Kansas. An Acrobat PDF version of this figure is available. The youngest Mississippian in the Kansas portion of the Hugoton Embayment is Chesteran. Next below are the Ste. Genevieve, St. Louis, Salem, and Warsaw, of Meramecian age, underlain by Osagian and Kinderhookian units. On the Pratt Anticline, in Pratt and Barber Counties, the Osagian-Kinderhookian is undifferentiated. The youngest unit in the Salina and Sedgwick Basins is Salem, which is underlain by Warsaw, Osagian, and Kinderhookian rocks. Rocks of Kinderhookian age are next below Pennsylvanian deposits subparallel to the crest of the Nemaha Anticline. The Ste. Genevieve occurs in the Forest City Basin in northeastern Kansas, surrounded by St. Louis, Salem, and Warsaw. Several areas of Osagian rocks are present in eastern Kansas, including, in the northeast, rocks along the eastern flank of the Nemaha. The area of the controversial Cowley Formation is shown in southern Kansas (Fig. 96). Until the problem of its stratigraphic placement is decided, its position in time and space in relation to other beds remains problematical. The age of the Chattanooga Shale in Kansas is variously identified as Devonian, Mississippian, or both. Because of the unconformity separating the Chattanooga from older rocks and the apparent conformable relation with overlying rocks, it is convenient to consider the Chattanooga with the Mississippian. Distribution of rocks on a surface directly below Chattanooga Shale, or, where Chattanooga (or Boice) Shale is absent, next below Mississippian limestone, is shown on Figure 97. No Mississippian or Chattanooga rocks remain on the northern part of the Nemaha Anticline, on isolated areas farther south along the crest of the uplift, or on the Central Kansas Uplift structures that are post-Mississippian in age. The distribution of rocks on the pre-Mississippian surface in these areas is therefore inferential. Figure 97--Map of Kansas showing rocks underlying Chattanooga Shale or inferred position in pre-Chattanooga time where Chattanooga is absent (in part from Lee and Merriam, 1954b; Lee, 1956; Merriam, 1955b). Dashed line delimits area lacking Mississippian cover. An Acrobat PDF version of this figure is available. Crustal movements prior to deposition of Mississippian rocks, or, in eastern Kansas, before accumulation of Chattanooga Shale, had marked effects on Kansas geology. The main structural features recorded in the pattern of pre-Mississippian and pre-Chattanooga outcrops are: the Chautauqua Arch, ancestral Central Kansas Uplift (sometimes called Ellis Arch), North Kansas Basin, and Southwest Kansas Basin. Central Kansas Arch is a name sometimes used for the combined ancestral Central Kansas Uplift and Chautauqua Arch and the connecting, relatively lower, but nevertheless positive element between the arches. Distribution of different Precambrian rock types below the Paleozoic-Precambrian unconformity in Kansas has been discussed previously and shown on Figure 87. The configuration of this surface is discussed under Present Structure. Paleozoic formations resting on Precambrian rocks are shown in Figure 98. Arbuckle-Reagan (Cambrian-Ordovician), Simpson and Viola (Ordovician), and Cherokee, Marmaton, and Lansing-Kansas City (Pennsylvanian) rocks are found to overlie the Precambrian. Levorsen (1960, p. 18) called this type of map, which is a view of the surface from below the unconformity, a "worm's eye" or "lap-out" map. The Paleotectonic Map Project of the Federal Geological Survey uses "suprageologic" for such maps (E. D. McKee, personal communication). Figure 98--Map of Kansas showing Paleozoic units that overlie Precambrian rocks. Only on structurally or topographically high areas do beds younger than Reagan Sandstone (Upper Cambrian) rest on basement. An Acrobat PDF version of this figure is available. Where formations younger than Arbuckle-Reagan are in contact with the Precambrian, indications are that Arbuckle-Reagan rocks were not deposited in the area or that these rocks were later uplifted and eroded from the area. Precambrian rocks were locally exposed in Kansas until Lansing-Kansas City time, when they were finally covered, and distribution of Paleozoic units indicates that upwarped areas were overstepped and buried. Walters (1946) in an excellent paper has related the history of some of the buried hills in central Kansas. The understanding of geologic history depends on preservation and interpretation of rocks, including the organic remains which they contain. In putting together past events in their proper sequence and perspective, one needs a complete rock record for a complete story. Desirable though this might be, however, it is not possible. Therefore the problem is one of continually gathering information and piecing it together. By comparing the relative ages of rocks present in Kansas to the ages of rocks elsewhere in the world, it is possible to arrive at an estimate as to the amount of rock record that is missing in Kansas. Although preliminary work has been done and is being done now in determining the exact age of rocks, the precise age of different rock units in Kansas is essentially not known. The sequence of events, as interpreted from the rocks, is based on the relative position of rock units; in the absence of exact age determinations, the amount of the missing record can be, at best, only vaguely estimated. Intervals of geologic time that are completely unrepresented in this region can be demonstrated readily, and it is with these intervals that we are concerned here. By tracing a persistent unit or other recognizable feature to areas where the geologic record is more nearly complete, it is possible to determine which rock units are missing. Where this is not possible, a study of the fossil record may reveal a break in the sequence. Several sources, the most important of which are the geological correlation charts published by the Geological Society of America (Cobban and Reeside, 1952; Cooper and others, 1942; Dunbar and others, 1960; Howell and others, 1944; Imlay, 1952; Moore and others, 1944; Reeside and others, 1957; Swartz and others, 1942; Twenhofel and others, 1954; Weller and others, 1948; and Wood and others, 1941), were used in compiling data showing which geologic time divisions are represented in Kansas (Fig. 99). Because the chart illustrated here is not drawn to scale, the position of rock units is relative. A quick glance reveals that many series are very incompletely represented. Figure 99--Chart of geologic time divisions showing, by shading, units present in Kansas. Note that 12 series are completely absent, and five more are only very incompletely represented. All major divisions of the rock systems are represented somewhere within Kansas, but several series are not represented. They are: Lower and Middle Cambrian, Cayugan (Upper Silurian), Lower Devonian, Ochoan (Upper Permian), Lower and Middle Triassic, Lower and Middle Jurassic, and Paleocene, Eocene, and Oligocene (Tertiary). Rocks of these ages, if they were ever present in Kansas, have been removed and are represented in the section only by unconformities. Series that are only very incompletely represented are Cincinnatian (Upper Ordovician), Upper Devonian, Upper Triassic, Comanchean (Lower Cretaceous), and Miocene (Tertiary). Probably the most nearly complete rock section in Kansas extends from the base of the Cherokee Group (Desmoinesian) to top of the "Taloga Formation" (Guadalupian), and even this part of the column contains many disconformities representing time of erosion or nondeposition of sediments. It is now possible by radioactivity to determine with reasonable accuracy the age of rocks. Although this is a slow and laborious process, many dates all over the world have now been determined. By using these dates, it is possible to estimate the duration of each geologic system and even of many series (Table 4). New and better procedures have recently made possible refinements in the geologic time scale (Kulp, 1961). However, few absolute dates for post-Precambrian rocks in Kansas have been determined by radioactivity. Table 4--Geologic time scale (from Holmes, 1959) and composite maximum thickness of rock units in the world. Holmes (1959) presented figures on composite maximum known thicknesses (Table 4): maximum thickness of the Quaternary is 6,000 feet, Tertiary 104,000 feet, Mesozoic 125,000 feet, and Paleozoic 217,000 feet. The total known thickness of all post-Precambrian rocks, then, is about 452,000 feet. The approximate thickness of rocks in Kansas is: Quaternary about 1,000 feet; Tertiary 800 feet; Mesozoic 3,650 feet; Paleozoic 10,500 feet; and the total about 16,000 feet. Of course, nowhere is there a complete column; the thickest known section in Kansas is about 9,500 feet, in the Hugoton Embayment in the southwestern part of Kansas. Several methods may be used to estimate the amount of time that is not represented by the rock section in a given area; although it should be remembered that they provide only estimates. One method is to assume that each of the series represents approximately one-third of the duration of its system. Because of the complete absence of 12 of 39 post-Precambrian series, about 208 million years of geologic history is not represented in Kansas. By adding four very incompletely represented series, which comprise about 80 million years, approximately 290 million years or about one-half of post-Precambrian geologic time is unrepresented. This approximation is valid only if entire systems or series are absent and the remaining series are completely represented. Of course, none of the series are complete, hence even more time is unrepresented than estimated. Another method used is to determine the amount of time represented by a given rock column, such as that of the Kansas region, which involves determining for each series the ratio of total known rock thickness to thickness in the area concerned. Certainly this is not a trustworthy basis for determination of time intervals, because sediment-accumulation rates differ enormously in different areas and because the total known rock thicknesses are aggregate sedimentary rock thicknesses of the world. Rock thickness per million years can be computed from time duration and maximum thickness of each series (Table 4). Ratio of the Quaternary is about 6,000 feet of rock per million years, whereas the ratio of the Cambrian is about 400 feet per million years. One possible explanation of this discrepancy is simply that more is known about the Quaternary because it is more readily available for study. Furthermore, erosion has not had enough time to strip away the younger rocks. Kay (1955) concluded that rates of subsidence rarely were more than 1,000 feet in 1 million years and probably never more than 3,000 feet; these rates are undoubtedly much too high for Kansas. Because the subsidence rates are based on rock thicknesses, the results computed from rates of subsidence involve the same errors as the results obtained by using rock thicknesses. The rates of sedimentation have been of great interest to geologists for many years, primarily because if the rates were known, estimates of the length of time required for the deposition of any formation would be found readily by dividing its thickness by that of one year's deposit. Such an objective, however, rarely is attainable. Sedimentation seldom is continuous: it is subject to many interruptions. . . . The shales average about one half millimeter per year or 700 yr per ft. Data for other rock types are too meager to compute an average rate of deposition. Because shales are the dominant type of sediment and accumulate at rates greater than limestone but less than sandstones, their rate of accumulation may be somewhat near that of the average sediment. If a constant sedimentation rate of 700 years per foot for the 16,000 feet aggregate maximum thickness of rocks in Kansas is assumed, other factors being negligible, the total time computed is far too few years to be realistic. A rate of 1,000 years per foot still gives too small a figure, and even at a rate of 5,000 years per foot of accumulation, approximately 85 percent of the record would be missing. This percentage is so great as to raise a question of how much trust, if any, can be placed in these methods. It has long been recognized that the Pennsylvanian rocks, as well as the lower Permian rocks, in eastern Kansas exhibit well-defined cyclic characteristics. By comparing the number of cycles with the total section, it should be possible to calculate how much time, as an average, was required for each cycle to develop. If it is known what each cycle or cyclothem should include and what is represented in the rock record, it should be possible to determine what part and how much of the cycle (or cyclothem) was not developed or was developed and subsequently destroyed. Assuming that each unit of the cycle required the same amount of time for development, one can calculate the amount of time not represented. These assumptions are not strictly correct, because each unit did not take the same amount of time to develop and, of course, some--maybe even many--cyclothems were not recorded at all. From the base of Cherokee rocks to the top of the Brownville Limestone (top of the Pennsylvanian System) a total of about 85 cycles can be recognized; thus, each cycle was completea in about 350,000 years. Weller (1930) determined that an average cycle in Illinois was completed in about 400,000 years. By comparing the ideal cycle to what is actually present, it may be determined that about 35 percent of the sedimentary rocks in the upper part of the Pennsylvanian is not represented. In Kansas, the downwarped basins are larger in areal extent than the uparched areas by a ratio of about 6:1, and likewise their volume of sediment is larger. The record is most nearly complete near the centers of the Forest City Basin, Cherokee Basin, Salina Basin, Sedgwick Basin, and the Hugoton Embayment. How much time is not represented by the rock record in each of these structural provinces will probably never be known, but it is estimated to be between 50 and 85 percent.